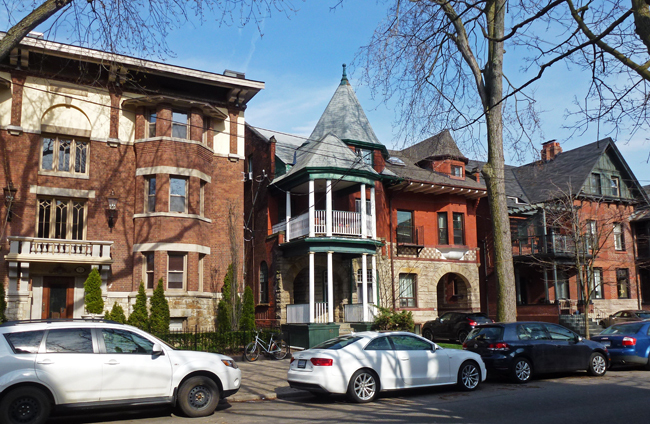 These large semi-detached homes are typical of the Annex neighbourhood but the low-rise apartment on the left is a little more unusual although it suits the area's style. These semis will set you back at least a few million dollars! Hello, pretty homes and street scene. Happy Thursday, enjoy your day! ...prices in Toronto take my breath away. Great looking buildings with some very hefty price tags. They are beautiful. The housing prices here tend to be more reasonable. From watching HGTV, I know that many of these homes are large and quite beautiful. But others needs lots of work. And even the latter cost a fortune! I don't understand the pricing but there's not much to be done when then market is there and the money is there. This is a very nice shot and yes the apartment on the left is quite different than the other homes but looks nice anyway. Beautiful looking homes. The prices are unreal but what a nice looking street and photo. I couldn't afford to live in the garage. Oh what a nice photo, P! This looks like a stylish neighborhood that is likely well beyond me. Good to see however. Lovely but pricey. Even huge houses in central Connecticut rarely top $1 million. I can see why Pat, they are fabulous! Looks like the whole street is quite exclusive. Well, I guess the only way I could afford staying there, would have been airbnb for a night or two. It so looks like home to me! Charmingly quaint, and kept so well!